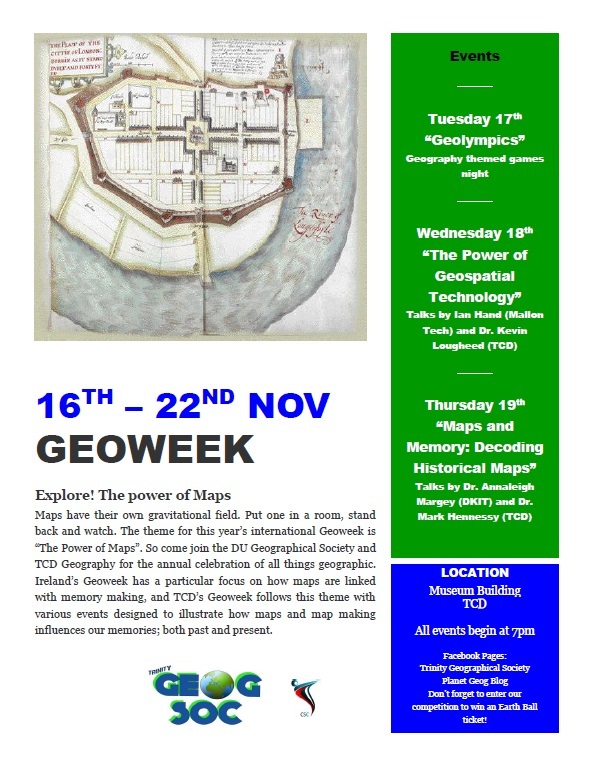 TCD GeoWeek takes place from Tuesday 17th - Thursday 19th November in the department of Geography. The theme for this year’s international Geoweek is “Explore! The Power of Maps”. Maps have their own gravitational field. Put one in a room, stand back and watch it attract all those around it. So come join the DU Geographical Society and TCD Geography for the annual celebration of all things geographic. Ireland’s Geoweek has a particular focus on how maps are linked with memory making, and TCD’s Geoweek follows this theme with various events designed to illustrate how maps and map-making influences our memories; both past and present. Thursday 19th Nov: "Maps and Memory: Decoding Historical Maps” public event with talks by Dr. Annaleigh Margey (DKIT) and Dr. Mark Hennessy (TCD), followed by a wine reception in the Freeman Library. Please email lougheek@tcd.ie to reserve a place for this event.